SEARCH for books and check the books you want to add to your list. To exit this screen tap outside the grey box. Your project will appear in your INACTIVE PROJECTS. 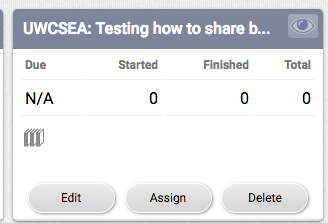 When you choose ASSIGN you can select your own students, individual students or an entire grade to share this with. This goes directly to all the students selected - they must have the blue check mark next to their name. Teachers who go to CLASSROOM - PROJECTS and selects myON COMMUNITY PROJECTS will be able to search for and find your project by its name. They can copy it to their myON and share with their students.